Cruise 40 is the Indel Bs 40 litres built-in box with L-shaped big evaporator. The fan-cooled compressor unit is placed on the base of the box and can be remotely mounted. With an A++ rating, this single-door dual cooling refrigerator preserves and freezes all your food products in optimum conditions, as demonstrated by the inclusion, for example, of a sliding storage compartment for cheese under the glass shelf. 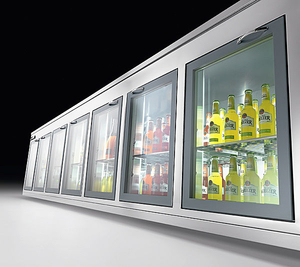 A built-in refrigerator is designed to be integrated into existing bar or kitchen spaces. It may be designed to fit into a cupboard or have a glass front to display its contents. These refrigerators are found in standard residential kitchens and in commercial settings, sometimes beneath a counter. Ensure that refrigerator dimensions correspond to the space available in the kitchen or beneath the counter. Decide whether the contents will be exposed or hidden. Decide whether fixed or adjustable shelving is more appropriate. Consider the need for a freezer compartment, built-in water or ice cube dispenser, a drawer for large items, self-cleaning or other features. Determine maintenance requirements, energy efficiency and how easy it is to replace broken parts. Verify the sturdiness and scratch resistance of shelving, drawers and other components.